Do you want to have your say in your climate future? This boy is not my responsibility. Tomorrow I will leave him behind. He will not be able to keep up and, even if he did keep up, he won’t make it across the border. He won’t get to safety. It is stupid to share resources with people who aren’t going to make it. What a story, what a protagonist, what an intense, impressive, extraordinary book! Mhairi’s story is one that immediately catches you. Following her path, her pain is the reader´s pain, her unbelievable, unbearable loss is the reader´s loss – and her hope is becoming the reader´s hope. You can´t help but feel personally involved in her story. Being angry at her for acting as dismissively and harshly as she does (especially with the little boy) at the same time understanding perfectly well the motivation of her behaviour. I did not read a YA title with a protagonist as individual, strong and disturbing as Mhairi within a long time. Her fight for a living, for her identity, for her belonging, her way of handling her past, her powerful voice make this story an unforgettable one. It takes over your heart and mind and provokes you to reflect. A powerful story. It’s searingly beautiful but both terrifying and deeply sad. 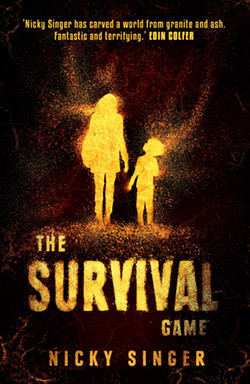 …But The Survival Game isn’t just beautifully written…it’s raw and energetic, lyrical and beautiful, intense and passionate. It also asks important questions and requires the reader to interrogate her or himself…It’s an absolute tour de force. Recent news about the treatment of refugee children makes this a particularly pertinent read. Singer’s gripping and provocative book poses big ethical questions, and has an ending likely to polarise readers.